When did the Anthropocene begin? | Letters from Gondwana. ← Doctor Who: Geologizing with the Tenth Doctor. The profound impact of human activity has motivated a concept that has been slowly emerging in science: human activities are a significant geological force. In 1873, Antonio Stoppani, an Italian Catholic priest and geologist, coined the “Anthropozoic era” to identify the increasing power and impact of humanity on the Earth’s systems. Few years later, Joseph LeConte in 1879 proposed the term Psychozoic to describe the same phenomenon, in 1922 Pavlov used the word Anthropogene, and Vernadsky in 1962 used the term Noosphere. In 2000 Paul Crutzen – during a meeting of the International Geosphere-Biosphere Programme (IGBP) in Mexico – proposed use the term Anthropocene to designate the last two hundred years of human history and to mark the end of the current Holocene geological epoch. He and Stoermer placed the beginning of the Anthropocene at A.D. 1750–1800, when the Greenland ice cores registered a dramatic increase of carbon dioxide and methane. Ruddiman and Thomson (2001) argued that before the industrial revolution, human societies had a great influence on the earth’s atmosphere. They identified the inefficient wet rice agriculture as the most plausible source of increased anthropogenic methane input to the atmosphere while the rise in CO2 is attributed to the expansion of agricultural landscapes, almost 8000 years ago. In 2011, Giacomo Certini and Riccardo Scalenghe used soils to identifying the base of the Anthropocene in stratigraphic sequences, but this method was questioned due to the poor preservation potential of soils. And in an interview in 2012, Eugene Stoermer considered that the geological mark for the Anthropocene was the isotopic signature of the first atomic bomb tests. 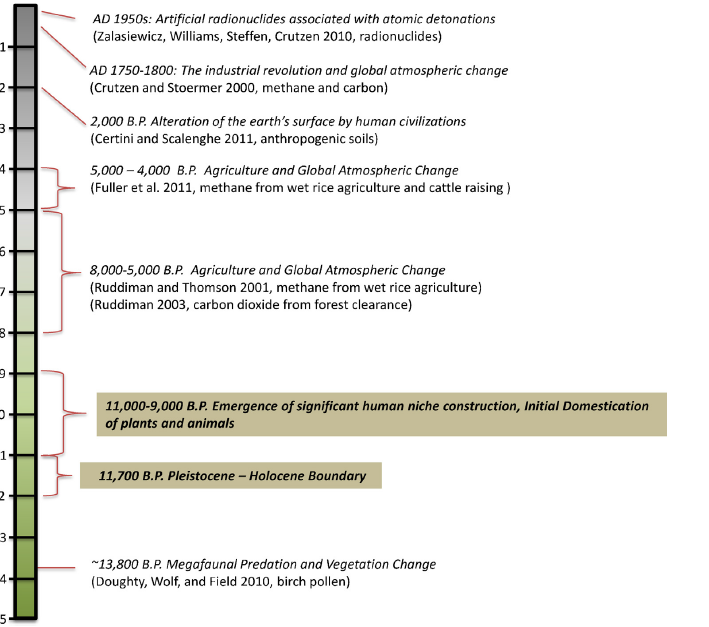 Because the different start dates for the Anthropocene a consensus solution to establishing its lower boundary was proposed: “The Holocene and Anthropocene epochs could on practical terms be merged into the Holocene/Anthropocene epoch, easily and efficiently encompassing 10,000 years of human modification of the earth’s biosphere” (Ellis, 2013). Ellis, E.C., 2011. Anthropogenic transformation of the terrestrial biosphere. Philosophical Transactions of the Royal Society A 369, 1010–1035. This entry was tagged Anthropocene, Earth, Earth Sciences, Eugene F. Stoermer, Geology, Holocene. Bookmark the permalink. Very interesting analysis! I hadn’t seen Doughty’s paper before, but Ruddiman’s theory is really cool. Thank you! And If you want to know more about Doughty’s paper,here’s the reference: C.E. Doughty, A. Wolf, C.B. Field, Biophysical feedbacks between the Pleistocene megafauna extinction and climate: the first human-induced global warming? Pingback: The Anthropocene defaunation process. | Letters from Gondwana. Pingback: The Great Acceleration. | Letters from Gondwana. The term “Antropoceno” was first introduced by the Mexican geologist Alberto R. V. Arellano in 1953, and appears as such in the compilation “”Geological Names of North America Introduced in 1936-1955” by Druid Wilson et al, 1957, U. S. Geological Survey Bulletin 1056-A, pp. 17.